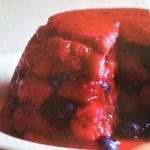 Summer pudding: You rarely see a summer pudding these days, possibly because they need some time and a little patients to put together. 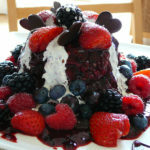 However, serving a summer pudding is an absolute delight because it is extremely colourful and very, very tasty! It’s one of those desserts that you could pull out of your culinary hat as a really special surprise. Place the gelatin leaf into a bowl of cold water until softened. Cook berries and sugar in a saucepan about 10 minutes until the berries start to soften. 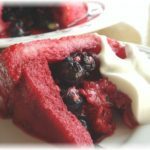 Strain juice into a saucepan and reserve berries. Heat the juice. Squeeze the gelatin to remove excess water, add to the juice and stir until dissolved, about 5 minutes. Set aside. Slice the brioche length-ways in 1 cm slices. Roll out thinly with a rolling pin. Cut the brioche into four disks measuring 7 cm (to fit the bottoms of the molds), four disks measuring 5 cm for the tops of the molds, and four rectangles measuring 5 cm x 2.5 cm to fit the sides (each rectangle will be used to line the inside walls of one mold). Dip both sides of the brioche pieces into the juice and line the base and sides of the molds. 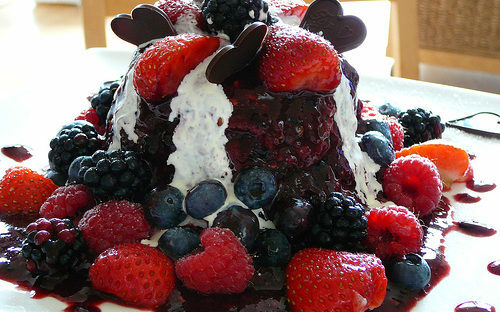 Mix the berries with the remaining juice and fill the center of the mold. Place the remaining circles of brioche on top and press down. 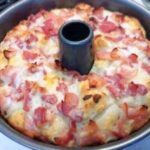 Place a tray or plate on top and allow to cool under weight, overnight. Whisk the whipping cream, vanilla and orange zest in a chilled bowl until the cream begins to stiffen. Add the sugar and continue beating until stiff peaks form and the cream clings to the whisk. Fit a piping bag with a star tip and fill with the orange-flavored Chantilly cream. Remove the pudding from the mold by running a knife around the inside and inverting onto the serving plate. Dust red currants with powdered sugar. Pipe rosettes of orange-flavored Chantilly cream on top. 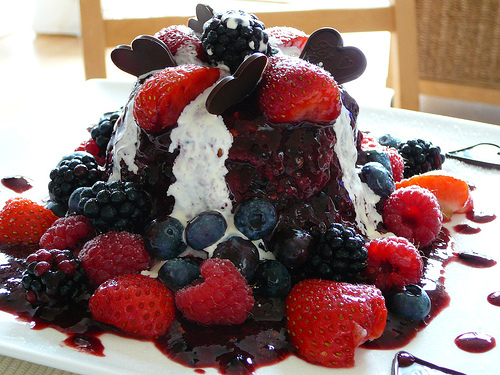 Decorate with berries and mint.